The goal: to get 100,000 kids worldwide learning how to code. The timeframe: one hour. The reason: because technology is the future of the world and the world is in the hands of the next generation, we might as well equip them early! Code.org is responsible for the largest education event in history called ‘Hour of Code’ which happened for the first time in 2013. Over 100 organizations took part in the initiative, most of them elementary schools, which taught young boys and girls how to code something. It’s a huge push to teach students about computer science from a young age, because if the way technology is advancing, that is an indicator of one vital skill they need to have. But it’s not just about getting the younger generation interested, more specifically, it is about girls because studies show that while girls outperform boys in math and science at elementary age, the figures flip once they hit high school. So how do you get more girls interested in this program for the second year running? Promote it using the year’s two biggest female film icons, duh! 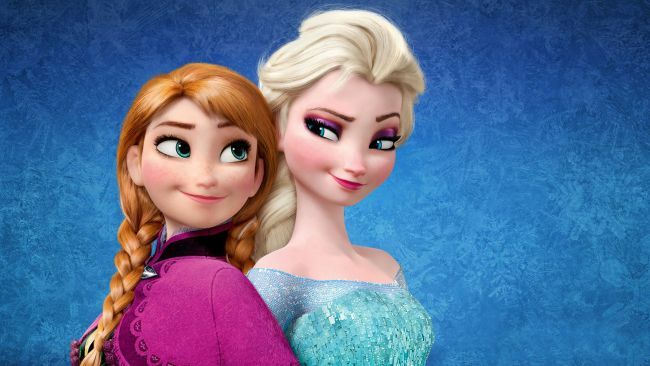 ‘Frozen’ princesses Anna and Elsa have been used as a clever way to lure girls into learning more about computer science, by using the slogan ‘Let it Code’ ( spin-off of the hit song ‘Let It Go’ from the Disney movie- which you already knew!). Last year approximately 47 million students took part in the Hour of Code, and this year, Code.org wants to reach 100,000. Founder of the non-profit, Hadi Partovi, says the major problem is that by the time girls are introduced to STEM careers, they are already college age and by then they have the ingrained notion that computer science careers are for men. Yep, turns out coding, along with many other industries, is also gender blind! Hurrah! So let’s get these girls coding already! Hadi said the partnership with Disney wasn’t exactly difficult to hook up, because the movie studio was the one who came calling. Code.org’s larger teaching platform called Code Studio is also now used in 50,000 classrooms. And almost half those students are girls. “We’ve had at least 20 million girls do the hour of code, and on our online tutorials, we have at least 40% participation by women, which is double the 20% that the tech industry sees. It’s because we’re starting younger before they encounter toxic stereotypes,” said Hadi. Time magazine shared some insightful statistics as to why learning to code is not just a novel idea, it is vital for the future of our global economy. “By 2020, U.S. universities won’t be able to fill even a third of the country’s projected 1.4 million computing positions with qualified graduates. But less than 18% of computer science degrees are awarded to female students, and only 20% of all software developers in the U.S. are women — even though women make up 56% of the labor force,” writes Eliana Dokterman. So it helps that Code.org is backed by tech industry luminaries such as Mark Zuckerberg (founder and CEO of Facebook) and Bill Gates (humanitarian and founder of Microsoft) because these initiatives are soon going to be very commonplace. Code.org joins the likes of Girls Who Code and Google’s Made With Code programs which are designed to engage young girls to take up careers in computer science and realize what they can create with a line of code. 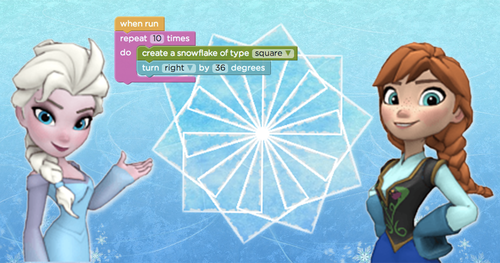 Kids learn basic logic and geometry skills during the Hour of Code, and this year will be able to draw snowflakes and icicles with Anna and Elsa. Ummm, not sure about you guys, but as a team of grown women we kinda want to get in on this hour of code! It all takes place between December 8-14, and you can find out more about the program, especially if you are a teacher or a parent. Get in on this by clicking here.